Winter Holidays – it’s time for presents! Get 6 months free of charge for Yaware.TimeTracker as a present! Start the New Year productively: take care of increasing the productivity of your employees today! The best investment into employees’ development can only be … the one that returns 50% of the price. Buy Yaware.TimeTracker for a year and get 6 months for free! You will save $48 on each license in 2016! May this year be mega-productive for you and your company! We wish you have more productive employees, successful projects, satisfied customers and big sales! 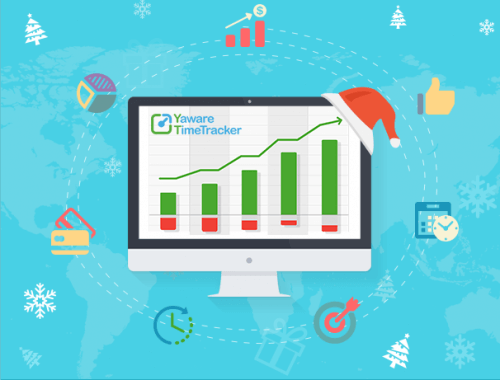 Everyone who buys a year subscription for Yaware.TimeTracker until December 31, 2015 will receive a 6 months free of charge use of the service. For those who buy more than 10 licenses, in addition to 6 months of charge-free use of Yaware.TimeTracker, we offer a special gift – 6 months of free use of Yaware.Mobile. Start the New Year productively!